It was August 3, 2008 when the “Patriarch” of anti-communism, Alexandr Solzhenitsyn, died. The writings of Solzhenitsyn became a major cource of anti-Soviet hysteria and extaordinary slanders against the first socialist state. Even today, Solzhenitsyn's major work “The Gulag Archipelago” is, more or less, regarded as the anti-communist “bible” of the world's apologists of capitalism and anti-soviet propaganda. The supposed “honest” testimonies of Solzhenitsyn- which he was never able to prove- were used in the building of an anti-stalinist, anti-communist obsession which the West had so much need to base upon, especially after the end of WW2. However, who was really this nobel prize-winning Russian and how much credibility do his anti-soviet fairy tales contain? The very heart of Solzhenitsyn's work is driven by his deathly enmity against communism. He tried to create for himself the image of a supposed “hero”, presenting himself as a persecuted dissident of Stalin's era. Those who celebrate Solzhenitsyn tend to forget that his 1946 conviction in eight years imprisonment was a result of his counter-revolutionary, pro-Nazi activity. 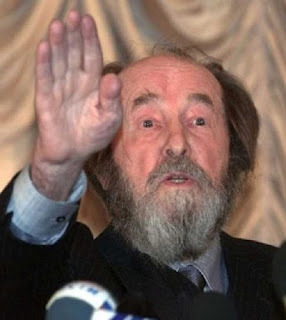 Alexandr Solzhenitsyn never hide his pro-Nazi feelings; in fact he accussed Stalin for driving the USSR to war instead of making an agreement with the Third Reich. For Solzhenitsyn, it was Stalin who should be blamed for the millions of Soviet victims in the war against fascism and not the imperialist, expansive policy of Nazi Germany! Years after the end of the Second World War, he was stating: “The German army could liberate the Soviet Union from Communism but Hitler was stupid and didn't use that weapon”. The “weapon”, according to Solzhenitsyn, was the efforts of various counter-revolutionary, anti-stalinist groups to dissolve the USSR from within. Such a “patriot” he was- a traitor who was ready to sell out his country and people to the Nazis. After his release from prison, Solzhenitsyn started to publish books in the Soviet Union, having the support of Nikita Khruschev's government. In fact, Solzhenitsyn (and his anti-communist fairytales) became another useful tool in the effort of Khruschev to promote his revisionist agenda and the so-called “de-stalinization” after the 20th CPSU Congress in 1956. Solzhenitsyn has connected his name with the support on the brutal fascist regime of General Frenco in Spain. The “icon” of “freedom” could not hide his fascist ideology: He supported a number of dictators, including Pinochet in Chile and Suharto in Indonesia. As South African writer Alex La Guma wrote in 1974, Solzhenitsyn had a- quite not surprising- distinction: Solzhenitsyn was “the only writer in the Soviet Union, as far as we can remember, to pass South Africa’s racist and anti-communist censorship examination” (Alexander Solzhenitsyn—Life Through a Crooked Eye”, African Communist, 1974). In his essay, La Guma concluded that Solzhenitsyn’s decidedly anti-Soviet, anti-communist perspective was implicitly congruent with the ideological foundations of South Africa’s ruling class and their stooges. It is characteristic that Solzhenitsyn- a privileged guest of Margaret Thatcher in Downing Street- never said a word against the South African racist Apartheid. For Solzhenitsyn the only significant issue was the propaganda he had created in his mind: the 110 million (!!! ), as he used to write, “victims of Stalin”. The real victims, the victims of Imperialism's brutality in South East Asia, in Latin America and in Africa had no importance for him. After 18 years in the US, he returned to Russia in 1994, almost three years since the total restoration of Capitalism by the corrupted counter-revolutionaries. Of course, Solzhenitsyn did say a single word about the 1993 bloody events in Moscow, when Yeltsin had ordered the army to bomb the House of Soviets. After the dominance of the counter-revolution in the USSR and Eastern Europe in the beginning of 1990s, Solzhenitsyn stopped being useful as a puppet of anti-communist propaganda. His clearly fascist, reactionary ideas were no longer significant for the interests of the imperialists who- after the 1989-1991 events- needed a more technocratic, neoliberal approach of the new capitalist status in Russia. History has reserved one of her darkest pages for Alexandr Solzhenitsyn. In 2008, just a few months after his death, the Russian government faced intense popular reaction when it decided to give his name to a Moscow street. 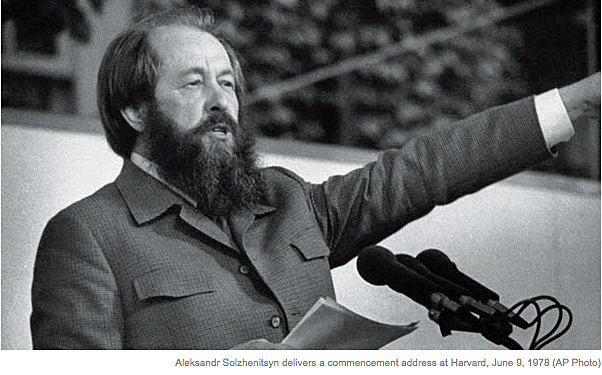 In the hearts of many Russians Solzhenitsyn “died” many decades earlier, when he conciously decided to ally himself with the fascists and the counter-revolutionary forces. The legacy of Solzhenitsyn- the one glorified by Capitalism's apologists- will be always sailing in an Archipelago of fascism and lies.